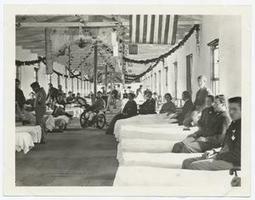 1 Medical treatment during the Civil War was not the same as it is today. Today, many soldiers survive, even with wounds that are very bad. During the days of the Civil War, something as simple as a scratch could kill you. 2 There were doctors during the Civil War. But they didn't have as much to work with as doctors have today. Penicillin had not been invented yet. Many medical students got two years of training or less. 3 If an injured soldier could not get up and walk, he would have to wait for someone to come get him on a stretcher. Some of the stretchers were very heavy. They could weigh more than twenty pounds. The injured soldier would then be taken to a battlefield hospital. This hospital would be near where the battle was taking place. 4 In a battlefield hospital, things were very bad. There were ether and chloroform during the Civil War. These could be used to put a patient to sleep. These usually weren't available in a battlefield hospital. The favorite drug of choice was whiskey. Some men were given a bullet and told to bite down. This was true even during amputations.